Hebrew is the language of three quarters of the Bible. It is also the primary language of the Siddur, the prayer book of synagogues all over the world. (The Bible also contains a smattering of Aramaic, a related language also written in Hebrew letters; the Siddur contains even more Aramaic.) 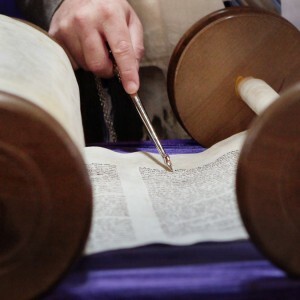 Congregants chant these prayers and may be invited up to the bimah–the table where the scrolls of the Torah and the Prophets are rolled out–to bless God for graciously giving His people the Scriptures and then chant a parasha (portion). Thus the Hebrew language of the Bible and Siddur has united Jews all over the world for thousands of years. Like Jewish children elsewhere, the children of Beit Simcha begin learning the aleph bet, the alphabet of Hebrew, as part of our Hebrew classes which happen in parallel with the Rabbi’s sermon. 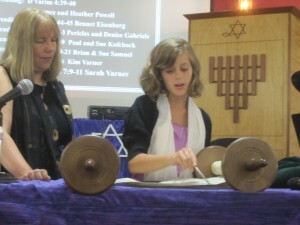 Then they learn the vocabulary and basic grammar of the Siddur, so that they participate in the prayers of our service. Finally, they learn how to read and then chant the maftir parasha (final portion) of the reading as well as the Haftarah portion (from the Prophets) for their bar or bat mitzvah day. In our Messianic Jewish congregation, there is also a portion from the New Covenant. The candidate also prepares a d’rash, a message giving the reader’s interpretation of what he chanted. At Beit Simcha, the young person also shares his or her commitment to be a responsible member of the community, to love and obey the God of Israel and the Messiah of Israel, Yeshua. We have learned that the preparation and public commitment is very important to our young people, sealing their loyalty to God, the Messiah and our community. Our chazzan (cantor) Beckie offers a Hebrew Blessings class for adults. In each class, participants learn how to read and chant and the meaning of one of the prayers in our Siddur. That way participants can join the class at any time, rather than wait for the class to start over again. Hebrew Blessings classes are usually offered after our oneg (delightful lunch) at both 1:15 and 1:45pm, on the second, third and fifth Shabbats. More advanced Hebrew lessons are available from our chazzan upon request. Contact us for more information about Beit Simcha’s Hebrew classes.